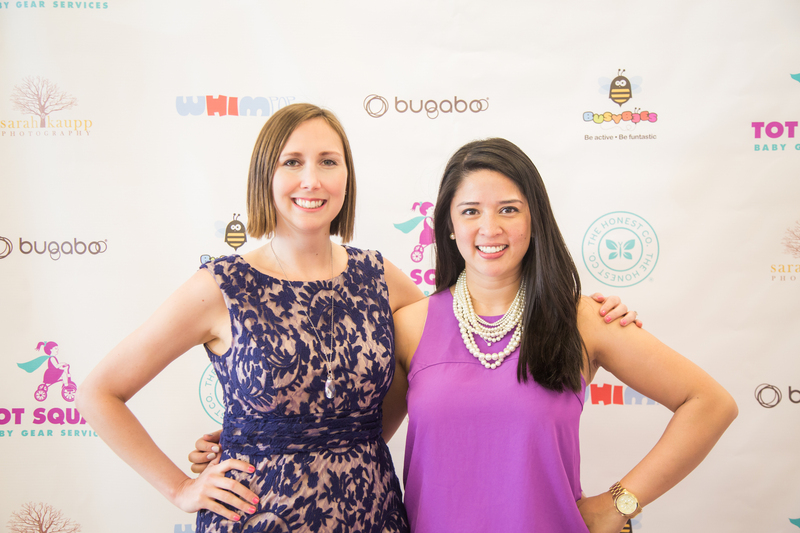 "I’m thrilled to bring a service to the DC area that has been long overdue for busy parents!" 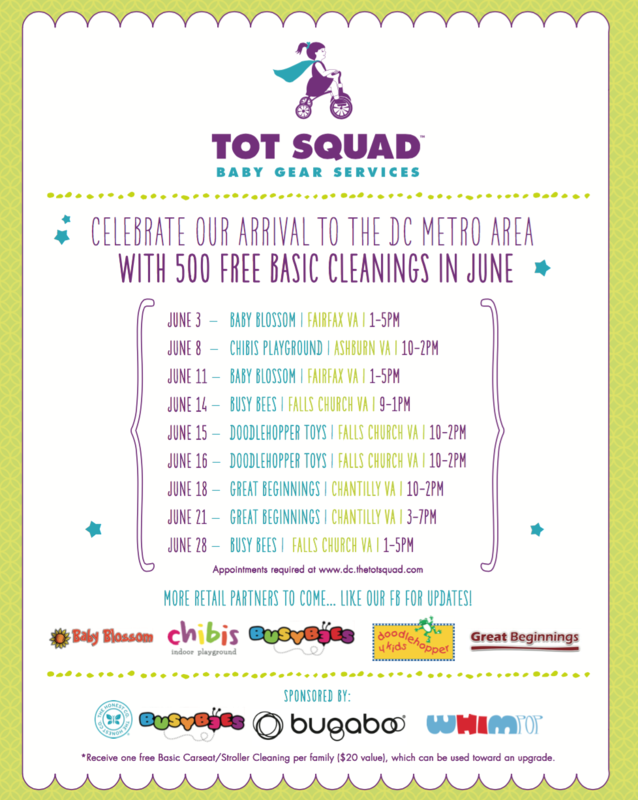 - Hayden Little, Owner of Tot Squad Washington D.C.
Tot Squad, the mobile service that provides eco-friendly cleaning and care of baby gear, today announced it will celebrate its launch in Washington DC with 500 free stroller cleanings in June. As the first franchisee of the growing Tot Squad empire, Hayden Little's objective is to come to the rescue of busy parents by offering car seat and stroller cleaning, stroller repairs and car seat safety education by certified Child Passenger Safety Technicians (CPSTs). Tot Squad will partner with well-known baby retailers and play spaces in different neighborhoods across the city, to provide convenient locations for parents to access their services. Their Washington DC launch includes a series of free cleaning events open to the public in June, which began with a Media/VIP launch event on May 24th. Parents will have the opportunity to try out the cleaning process without paying. Launch events will be held at popular local kids places like Babies "R" Us, Busy Bees, Baby Blossom, Great Beginnings, Kidville Fallsgrove, Chibis Playground, and Doodlehopper 4 Kids. Parents can sign up by booking online at dc.thetotsquad.com, emailing dc(at)thetotsquad(dot)com or calling (703) 662-3539. Waitlists are expected. Tot Squad not only offers the ultimate convenience to families, but also provides peace of mind. Tot Squad uses eco-friendly, non-toxic, and baby-safe cleaning products from The Honest Company, in conjunction with hot steam to remove odors and help attack mold and harmful germs lurking in baby items. Furthermore, studies show that as many as 90% of car seats are misused and with car accidents being a top cause of death for children under 14, a car seat check appointment with a CPST is a must-have for all new parents. Tot Squad will also be offering stroller repair and tune-up services and is an authorized service provider for Bugaboo, Orbitbaby, UPPAbaby and Maclaren. After the free launch events, Tot Squad will begin offering regular services starting in July, including house calls, private parties, and preschool fundraisers. Gift certificates are also available for baby showers and other special occasions. Founded in 2011 in Los Angeles, Tot Squad has been featured for its eco-friendly mobile care and cleaning service for strollers and car seats on The Doctors TV show, as well as The Wall Street Journal, Businessweek, Forbes and Entrepreneur Magazine. CNBC dubbed Tot Squad a "red hot" franchise concept after winning the grand prize in the 2015 NextGen Global Franchising competition for millennial entrepreneurs. With locations in SoCal and NYC, the business is expanding nationwide and continues to bring new and enhanced services to the forefront. Tot Squad is a trusted partner of retailers, as well as of stroller and car seat brands, and has served over 20,000 happy parents to date.